Back before the High Line was a park, a humble stack of bricks hugged the elevated rails at 51 Little West 12th Street. Since people started walking the rails last summer, this three-story piece of edgy old New York has been a popular photo op thanks to its junk-strewn patio right next to the platform, just south of the Standard Hotel. Er, no longer. 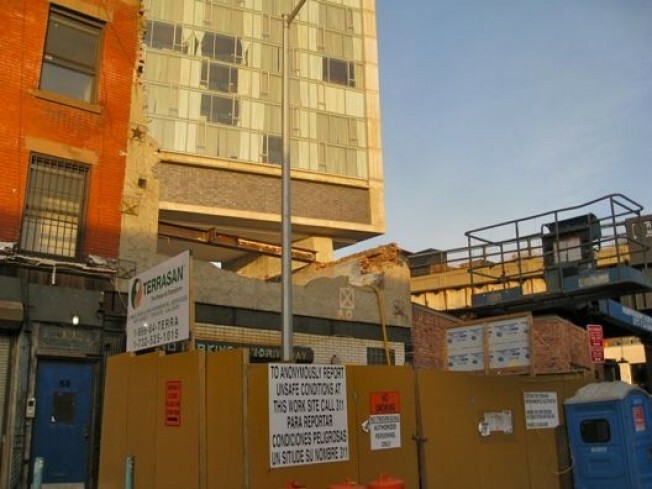 The old Astor horse stable that stood for more than 150 years is now gone, demolished following an "immediate emergency declaration" from the Department of Buildings stating that the building was "unsafe and in imminent peril." Disco survivor and overall colorful character Novac Noury has owned the place since the '80s (the junk was his), and he's long had a dream to build his own "Stairway to the High Line" here. He also once refused André Balazs's buyout offer, and instead proposed a partnership with the Standard Hotel that would've turned his property into a "mini-inn" built up to 10 stories. Didn't happen. He then accused the hotel of putting cracks in his building during construction, and Noury chronicled the indignities, including the rupture of an underground stream that he claimed undermined his foundation and gave it a case of the shakes. Now that demolition is nearly complete, what the future holds in store for this little lot remains unknown. Maybe André Balazs will snap it up once he stops cackling.